I have an amazing herbalist and “doc” that I see every month or so to check me out. When I first started going to him it was summertime and although I had very little physical complaints I did tell him that I had, what I call, the summer bloat. Summer bloat (to me) is when I wake up in the morning and can’t put my rings on, my hands feel swollen and I generally feel “puffy” all over. He told me that I was “holding on” to extra water and he recommended I make and drink parsley tea. WHAT? I had never heard of parsley tea before! If you were previously in the dark about this easy fab fix I’m going to share with you its benefits (and also when NOT to drink). Contains a compound known as apiol, which is helpful in regulating irregular menstrual cycle and other menstrual disorders and has been shown that parsley tea eases menstrual pain and cramps. Its high levels of beta-carotene, folate and vitamin B12. help reduces the level of LDL cholesterol as well as the risk of homocysteine in blood. Thus it boosts the cardiovascular health of an individual. An infusion of parsley is recommended for people who suffer from chronic fatigue. Rich in vitamin C and has anti-inflammatory properties. Because of this, consumption of parsley tea can aid in combating arthritis and rheumatism. Used in easing discomfort from bladder infection. 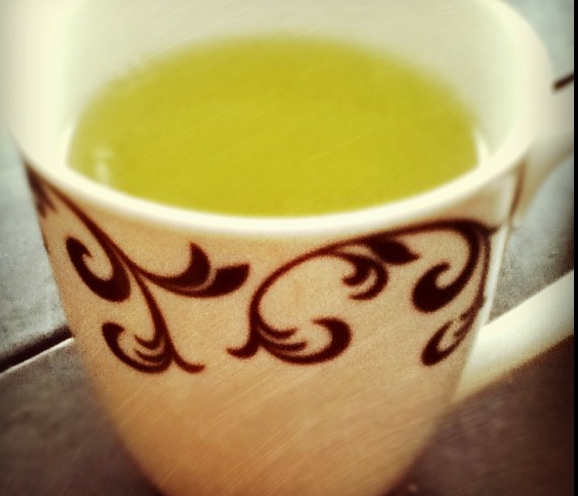 Make SURE that you are well hydrated when you are adding parsley tea to your diet. Since it has diuretic properties you want to be sure that your bod is properly hydrated. Parsley tea is really easy to make. Get a bunch of organic parsley (local if possible) from your market. Wash it throughly. Take a large pot and fill it with 6 – 8 cups of filtered water. Put the bunch of parsley into the pot, bring the water/parsley to a boil and cover the pot turn the heat off and let it sit for 30 minutes. After 30 minutes you strain the water into a pitcher or pot and you’re ready to consume! I make my pot of tea about once or twice a month and If I feel like I need a bit more of a “detox” I take my Pure Acai Berry for detox (usually on a Monday). I’ll add the tea in to my normally healthful diet. I drink it hot or cold and sometimes I squeeze in a 1/4 of a fresh organic lemon. I make about 6 – 8 cups of tea at a time, so I’ll have 2 cups a day until it’s gone. Try it out…let me know what YOU think! This entry was posted in FIERCE HEALTH, FIERCE SOUL, FIERCE- ISH and tagged balance, food, fun, health, mental health, metabolism, mindful eating, nutrition, parsley tea, weight-loss, wellness by GETFIERCE TRAINING. Bookmark the permalink.